Home Computer network THREE VIEWS (EXTERNAL, CONCEPTUAL AND INTERNAL) OF DATA IN DATABASE. 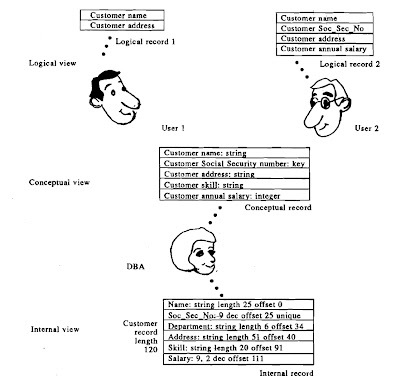 THREE VIEWS (EXTERNAL, CONCEPTUAL AND INTERNAL) OF DATA IN DATABASE. DBMS is a collection of interrelated files and a set of programs that allow several users to access and modify these files. 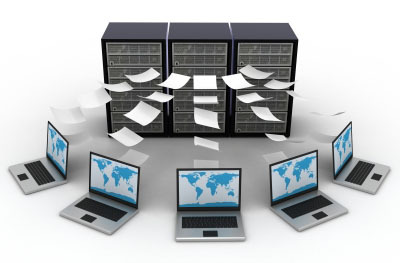 A major purpose of a database system is to provide users with an abstract view of the data. That is, the system hides certain details of how the data is stored and maintained. However, in order for the system to be usable, data must be retrieved efficiently. The concern for efficiently leads to the design of complex data structure for the representation of data in the database. However since database systems are often used by non computer professionals, this complexity must be hidden from database system users. This is done by defining levels of abstract as which the database may be viewed, there are logical view or external, conceptual view and internal view or physical view. External view: This is the highest level of abstraction as seen by a user. This level of abstraction describes only the part of entire database. Conceptual view: This is the next higher level of abstraction which is the sum total of user's views. This level describes what data are actually stored in the database. This level contains information about entire database in terms of a small number of relatively simple structures. Internal level: This is the lowest level of abstraction at which one describes how the data are physically stored. The interrelationship of any three levels of abstraction is illustrated in image here.